What are your concerns about indoor Air Quality? Since the energy crisis of 1974, the American public has made a conscious effort to save energy. The typical U.S. home is now tighter and more efficient than ever before; but these steps to prevent heat loss often have a negative effect. Energy efficiency measures such as adding insulation, weather-stripping, caulking, etc., does prevent heat loss but, simultaneously traps bad air indoors. Since most Americans spend 90% of their time indoors, breathing clean air can have an important impact on their health. Our exposure to toxic materials indoors is 5-10 times greater than it is outdoors. While outdoor air has a dilution effect on pollutants, indoor air tends to trap and intensify pollutants. Air ducts naturally accumulate sizeable deposits of dust and other contaminants over a period of years and, in some cases, months. This debris can reduce the efficiency of your heating and air conditioning system and even cause physical discomfort and illness by degrading the quality of air you breathe indoors. Dust and other contaminates are actually pulled into the mechanical conveyance system through the return side of the system and from exterior sources. These contaminates build up inside the return ductwork. Many homes utilize inefficient filters, which trap less than 10 percent of the particulate that is drawn in the system. Your Health– Duct cleaning improves the health of your home living environment. It is estimated that ½ of all upper respiratory illnesses are caused by poor indoor air quality. Your Home– Duct cleaning removes a substantial amount of dust and debris from your home, in some cases as much as ten pounds may be removed. These airborne pollutants contribute to dust in the air, on your furniture, and in your carpet. Your Wallet– Dust and debris that is drawn into your system will soon overcome a standard household filter and begin to accumulate in the mechanical systems and ductwork. Once this occurs the system is less efficient and must run longer to do the same job as when it is clean. The cumulative savings here will pay for the cleaning over a few years. Some 50% of illnesses are either caused or aggravated by polluted indoor air! What type of procedure does Central Heating and Air Conditioning use to clean my system? Central Heating and Air Conditioning has been providing indoor air quality solutions SINCE 1947. We employ and train highly competent individuals to best serve the needs of our customer. Upon arriving at your home our lead technician will walk through and count the registers in your home while explaining the process to be used in cleaning your system. 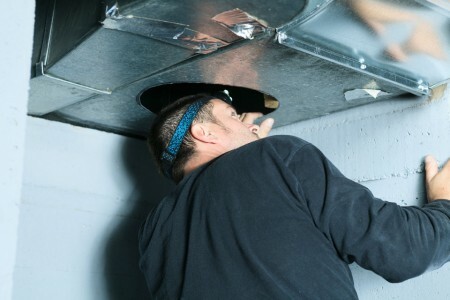 Source removal duct cleaning is considered the best method for relieving indoor air quality problems and is the only method endorsed by the National Air Duct Cleaners Association (NADCA). Central Heating and Air Conditioning utilizes source removal technology for duct cleaning. We use high velocity compressed air along with a high volume vacuum system (9000cfm) to dislodge contaminates and pull them from your home. We use specially designed air whips, airsweeps and rotary brushes to ensure proper removal of contaminates. All grills, registers, diffusers and plenums are cleaned and sanitized. After the cleaning an EPA approved sanitizer is fogged through the system. This sanitizer will kill mold, bacteria, and fungus.